We ask that the article below, from IBD Editorials, be read objectively. I attended the first Tea Party with Glenn Beck in San Antonio, Texas. It was a day that will remain with me forever because in my opinion it was the day that America's "silent majority" found its voice. The Tea Party has accomplished the unimaginable. Now it is time to regroup and prepare for the battle to save America from the clutches of Barack Hussein Obama and his minions. We are NOT the majority in Washington, D.C. YET! The Democrats in the Senate and a Democrat president still outnumber us. We simply cannot win every battle with those odds. We should also not be willing to sacrifice our country for the sake of stubborn pride. If we bide our time, play our cards right, and do not become too complacent with our past accomplishments and the power that we have gained since the Tea Party was formed, we can defeat the Socialists and Marxists who threaten our very independence, indeed our Republic and the way of life we have always enjoyed. Remember Proverbs 16:18 - "Pride goeth before destruction, And a haughty spirit before a fall." Debt Battle: The Tea Party has proved its power — and its principle. Now it's time to declare an imperfect battlefield victory in 2011 and regroup for the more important struggle of defeating President Obama in 2012. Champions of smaller government, low taxes and a freedom-driven economy shouldn't expect whatever the end result of "Boehner 2.0" is to be worth very much cheering, especially after Harry Reid's Senate gets through with it. But with the clock ticking on the federal government's debt deadline, Tea Partyers should take whatever half-loaf now comes their way. They've demonstrated that theirs is one of the most formidable grassroots movements in American history. What they stand for is right, and would make our Founding Fathers proud. And they've demonstrated that they're the real deal, not shills for those who are a little right of center within the Republican Party. Bismarck might not be the Tea Party's favorite historical figure, but his advice has never been more pertinent than here and now: "Politics is the art of the possible." Tea Partyers shouldn't lament that their preferred Cut, Cap, Balance approach, which passed the House, is impossible to get enacted into law in 2011; rather, they should take pride in realizing that because of their movement, real spending reform is indeed politically possible — just not this year. 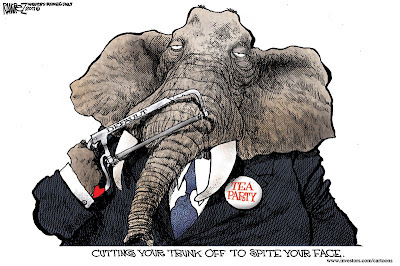 They're poised to be a part of replacing Barack Obama with a Tea Party president. But that won't happen if they let Obama shift the blame for this economy to Tea Party-beholden GOP congressmen. What'll happen in that case is very likely the collapse of the Tea Party as a serious force. Leaders of this great movement should know better than anyone that the war against spending is a long one. Even if by some miracle, $3 trillion or $4 trillion in cuts did materialize this year, we're still talking about government debt less than a decade from now approaching $30 trillion. This debt ceiling conflict is only the opening shot of their People's Revolt against such madness. Entitlement reform and elimination of wasteful agencies, not to mention the possibility of a Balanced Budget Amendment being ratified by the states, are all battles that lie ahead. But they are battles that will be won only with control of both the White House and Congress. What the Senate and House agree to is unlikely to include a BBA. Still, the Tea Party should take it, declare a partial win for its agenda and get to work ousting Obama in pursuit of the completion of their goals. GOP internecine warfare only wastes ammunition that will be needed next year — for the real fight. As Sun Tzu advised, "He who knows when he can fight and when he cannot will be victorious." For the Tea Party, now is the time to lock and load and wait till next year. Wow - great minds think alike. I wrote just about the same thing on my web site today.